The Eldorado Brougham was conceived, developed and carefully custom-crafted with but one objective in mind ... to provide the finest limited-production luxury motor car possible for the worlds most discriminating motorists. Bringing this objective into automotive reality required over two years of the most intensive concentration and teamwork between Cadillac designers, styling and engineering specialists of the General Motors Technical Center. We believe that when your prospects know the facts about the Eldorado Brougham and the unique measure of pleasure which it provides, they will agree that here indeed is the finest motor car ever created. In the year 1701, about eight miles downstream of lake St. Clair, the self-proclaimed French nobleman Sieur Antoine de la Mothe Cadillac (real name Antoine Laumet, a suspected privateer and trafficker who, it has been said, acquired his noble title by questionable means) established a trading post which he named Ville d'Etroit (the town on the narrows). According to one source [The French magazine Historia], "Tony" Laumet continued his peregrinations in Louisiana, wheeling and dealing with the local Indian population, amassing considerable wealth in the process. Later, he was made governor of the city of Castelsarrasin in south-western France. Ville d'Etroit prospered and grew to become Detroit, the motor capital of the world. A bust of the explorer, Cadillac [below], may be seen at the Detroit City Museum. Considering the amount of gold bounty stolen from the Indians by Spain's Francisco Pizzarro, one may well imagine that he and his men found more than one el dorado on their pillaging conquest of these lands. Of high inspiration, the Eldorado name, like the name Cadillac itself, has become synonymous with high-standing, perfection, and a certain degree of affluence. The name was not the fruit of the imagination of some brilliant advertising copy-writer. It was selected more prosaically in an in-house competition in which all Cadillac employees were invited to participate. The object of the competition was to find a name for a special Golden Anniversary convertible model that was to be shown by Cadillac at the 1952 auto shows. The lucky winner was one Mary-Ann Zukosky, an employee in Cadillacs merchandising department. Her winning entry was subsequently adopted by the firm for their limited-production convertibles of 1953. To this day, some of the finest Cadillacs on the road still bear the renowned Eldorado name. Henry Peter Brougham and Vaux, 1st Baron and Lord Chancellor of England was born in Edinburgh, Scotland, September 19, 1778. Orator, wit, man of fashion and confirmed eccentric, he was, inter alia, the designer of the four-wheeled, horse-drawn carriage that would bear his name. The Brougham horse-drawn carriage had a low coupe body with a box seat for the driver and one forward facing seat for two passengers. Some had seating for four passengers. Through Baron Brougham, too, the renowned French seaside resort of Nice became very popular and the beach front promenade there became known as the Promenade des anglais (the promenade where the English are wont to stroll). Brougham died in Cannes on May 7, 1868, a few years still before the birth of the automobile. Cadillac introduced the first Cadillac Brougham model in 1916. That body style went out of fashion in the thirties. Twenty years would elapse before the "Brougham" name would be adopted again, in 1957, for the luxurious four-seater, four-door sedan that is described in these chapters and which the company would built in limited numbers for the next four years. The name was revived once again in 1965-66 for the top-of-the-line Fleetwood Sixty Special models. These cars, however, had nothing as exceptional to offer as had the Broughams of 1957-1960. The "third generation" Cadillac Broughams simply featured more luxurious appointments than the standard Cadillac models of the same year. These late Broughams were preceded, from 1938 until 1965-66, by the renowned Cadillac Sixty Special series. 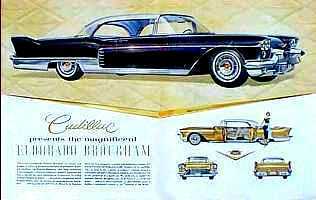 The three names were combined, in 1955, and given to an experimental "dream car", forebear of the luxurious Eldorado Brougham models on which the Detroit firm continued in the late fifties and early sixties to carve its high reputation as the makers of the The Standard of the World. Below, the Eldorado Brougham in a well-known publicity photo shot in Miami during the Motorama venue. In 1928, Cadillac had created the Art and Colour section under the impulse of Harley J. Earl, a young automotive designer who had worked until then for Don Lee, the Hollywood Cadillac dealer. Earl had been designing special bodies there, for wealthy film stars. Ten years later a new recruit joined the Art and Colour team, whose efforts had already earned Cadillac a solid reputation as a style leader and innovator. His name was William F. Mitchell. Harley and "Big Bill" were jointly responsible for the style-setting Cadillac Series Sixty Special of 1938. The Cadillac Eldorado Brougham was their post-WW2 styling coup de force. While no single Cadillac stylist may be credited with the final design, the latter began on the drawing boards of Bob Scheelk, a new recruit to the GM Styling section [the new name for Art and Color]. Bob's work was supervised by Charles "Chuck" Jordan, who had taken over from Ed Glowacke, and by Chuck's assistant, Dave Holls. On September 15, 1955, the Styling section moved from its old quarters in downtown Detroit to the new, ultra-modern General Motors Technical Center at Warren, north of the Motor City. From that day forward, Cadillacs adopted a new, lighter, brighter look, like that of the new buildings where they were being designed. Manufactured by the Cadillac Division of General Motors Corporation from 1957 through 1960, the Eldorado Brougham was the product of several years of engineering and styling development. It was preceded by a number of experimental models and so-called dream cars including, principally, the Cadillac Orleans (1953), the Park Avenue (1954), the Eldorado Brougham prototype (1955), the second Eldorado Brougham prototype and Paris show car (1955-56) and the Eldorado Brougham Town Car (1956). The first production Eldorado Brougham (car #3) was shown at the New York Salon in January 1957. This car was featured also in a factory promotional film set in New York's Central Park, where it stole the limelight from another, specially-appointed Cadillac Series Sixty Special, the Director, that was all decked out as a mobile office [below, right]. The New York Show Brougham, i.e. the production car, differed in many respects from the production prototype that had been shown in Paris, two years earlier, and in New York in 1956. The latter car, the so-called Paris Brougham, was featured in a rare and beautiful, stiff colored folder with a silver cover [below, left]. On the other hand, the corresponding advertising brochure for the production Eldorado Brougham, issued in 1957, was printed on lightweight paper stock and - in this writers opinion - certainly not in keeping with the supremely luxurious automobile it was intended to promote. Despite its astronomical price tag [for the time], each Brougham was effectively sold at a considerable loss [a figure of $10,000 per car has been quoted]. Even today, despite their relative scarcity, their value remains modest compared with most fifties Cadillac convertible and coupe styles. Below is another view of Brougham #3 during the 1957 New York auto show. In concluding this introduction I would like to express my sincere thanks to Cy Strickler III, former President of the Brougham Owners' Association (B.O.A. ), without whose groundwork and in-depth research this section of the Cadillac Database© would be largely incomplete. After a period of relative inactivity in the late seventies and early eighties, the BOA was given new impetus by long-standing member and co-founder, Allan Dowling. Allan has a site devoted entirely to the Brougham. Another site devoted entirely to the Eldorado Broughams of 1957/58 is this one by Michael Rizutto [this one is a commercial site]. Finally this third Brougham site will interest those of you who are contemplating the restoration of one of these complex automobiles; our thanks to Vic Brincat for putting on line this excellent reference source! This other would-be Eldorado Brougham convertible was featured on the cover of Motor Life for October 1956. As you can see from the size of the gentleman at the wheel, it is a much smaller car than the Brougham. In fact it is built on the chassis of a 1956 Ford Thunderbird. Still, if you saw it cruising by, you would probably do a double-take ! The closest thing to it, in Europe, in terms of rarity was France's Facel-Vega HK500 "Excellence" of which a mere 152 units were built between 1956 and 1964. It was powered by a 6-liter Chrysler OHC V-8 and could cruise along at 140 mph !